03:09 PM - Bagelismygecko quoted Elizabeth Freer in post Amount if food for leopard gecko? 05:33 PM - Elizabeth Freer quoted Bagelismygecko in post Amount if food for leopard gecko? 11:17 PM - Bagelismygecko quoted Geopard Lecko in post Amount if food for leopard gecko? 09:58 PM - Bagelismygecko quoted Geopard Lecko in post Name? 08:23 PM - Sg612 quoted Bagelismygecko in post Mealworms or crickets as a main? 09:36 PM - Bagelismygecko quoted Sg612 in post Good Exo Terra for Leo? 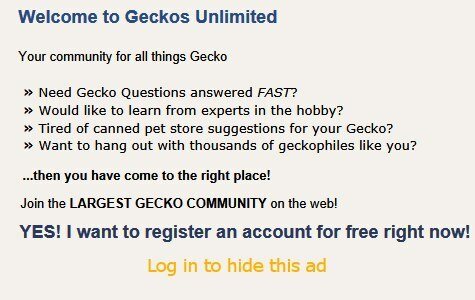 10:40 PM - Bagelismygecko quoted Geecko123 in post Are there any problems with my leopard gecko?? 11:03 AM - Bagelismygecko quoted Geecko123 in post Are there any problems with my leopard gecko? ?